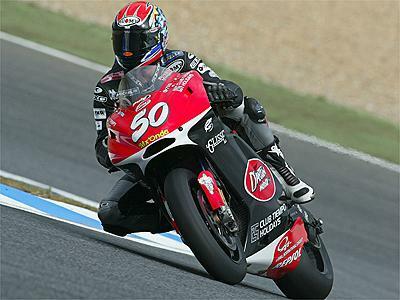 Rumours are growing that Neil Hodgson is about to sign to switch from Ducati to Suzuki for the 2005 season. MCN is in Japan for this weekend's Motegi race and will be rooting around for the truth and bring you updates as we get them. Expect to see first practice times on this site first thing Friday morning (Sep 17). And, ahead of this weekend's races, organisers have decided that rain will not be allowed to stop play in MotoGP from the start of the 2005 season. Riders will instead have to come into the pits if they want to change rubber - or swop to a spare bike. It means races will be run from flag to flag - like the F1 car GPs. It's thought the move has been made to suit the demands of TV bosses.